One of the many things I enjoy about being an expat is the fact that I keep being surprised by my country of adoption, everything is new still. Which brings me to today’s topic: FOOTY! 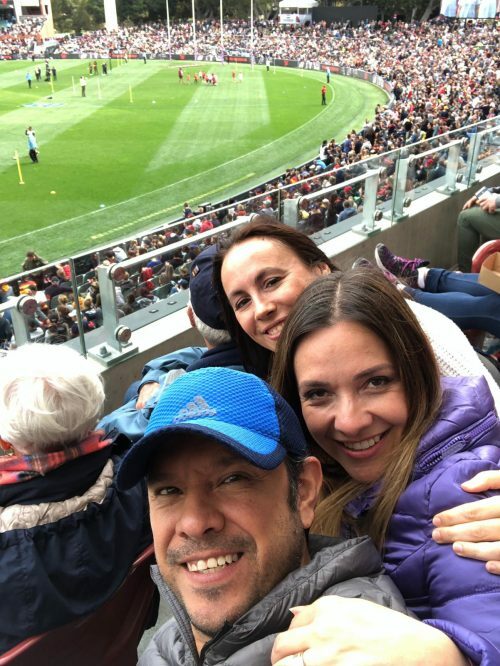 Sport seems to be a big thing in Australia and I m always keen on exploring new horizons and Sunday March 31 was my first footy game at the Adelaide Oval!!! yayyyyyyyy celebrationnnnnn, big time! 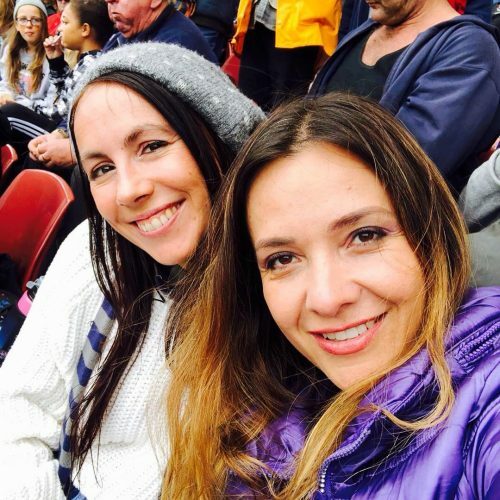 But in Australia everything is different, so forget what you think you know about football/soccer (especially if you are from Europe) because this is nothing like you have experienced so far! So erase your mind and follow me! First of all, Australian footy, is a contact sport played between two teams of eighteen players on an oval shaped field (like on a cricket ground). Points are scored by kicking the oval shaped ball between goal posts (worth six points) or between behind posts (worth one point). So what does it mean? Well to me basically, it looks like a melting pot of soccer, rugby on a cricket field. Yes I know…. crazy?! Maybe Aussie footie is like an English pudding, you basically combine some leftovers together , let’s say a croissant, a brownie and a muffin, you mix it all and voila luckily you create something new and hopefully tasty! Me, Jess and Luis (Mexico) having a selfie session during the game! So if you live in Adelaide, you support: THE CROWS, that’s our team! So basically MARCH 31, 2019 was the Grand Final match between the Adelaide Crows and the Carlton Blues at the Oval stadium and WE won!!!! The girls did it, not only they did, they litteraly smashed it, it was a great game! So that made the experience even more interesting 🙂 and I can’t thank enough my Mexican friends Jessica and Luis for inviting me there as this was their idea and I really really loved it! We had a good time altogether. Besides it was a free event as it was girls footy and a lot of people attend to this game and the atmosphere was really good! Seflies sessions, fries and chicken popcorn all along, a great way to enjoy fully the game! All in all this s was a monumental day for AFLW, and women’s sport in general, in many ways. 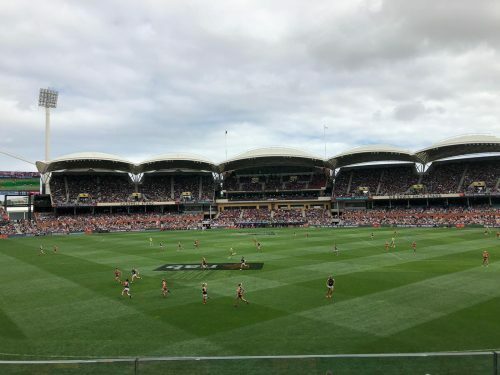 A crowd of 30,000 was expected, but the Adelaide public arrived in droves for an official attendance of 53,034. 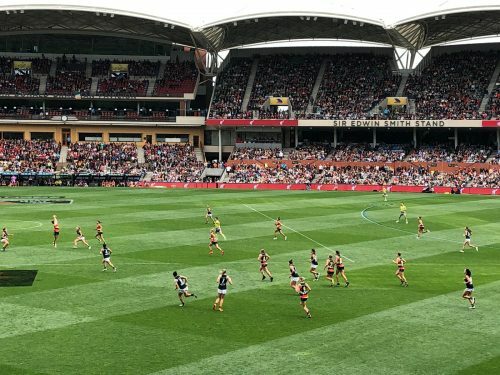 It was easily the largest crowd for a women’s game of Australian football and the fifth-biggest crowd at Adelaide Oval for any football game.